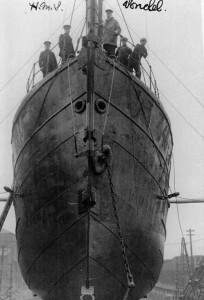 3.4.1911: Launched by Cochrane & Sons, Selby (Yd.No.482) for The Atlas Fishing Co Ltd (64/64), Grimsby as VOLONEL. 12.5.1911: Registered at Grimsby (GY628). 12.5.1911: William Somerville Letten appointed manager. 1915: Requisitioned for war service as a minesweeper (Ad.No.849). Based Humber. 5.2.1916: George Somerville Letten appointed manager. Post 12.3.1919: Returned to owners at Grimsby. 6.1923: Sold to Soc. Anon Pêcheries Ostendaises, Ostend (Aspeslagh Frères & A. Deceuninck, managers). 9.6.1923: Grimsby registry closed. Registered at Ostend as NARVAL (O141). 1928: Sold to Boston Deep Sea Fishing & Ice Co Ltd, Fleetwood (Basil A. Parkes, Blackpool, manager). Registered at Ostend as KASAÏ (O271). 10.1929: Sold to Soc. Anon Pêcheries Ostendaises, Ostend (Aspeslagh Frères & A. Deceuninck, managers). 1930: Sold to N.V. Visscherij Maats “En Avant”, IJmuiden (Erenst & Weimar, managers). Ostend registry closed. Renamed EN AVANT (IJM8). By 1938: Sold to N.V. Visscherij Maats “De Daad”, IJmuiden. 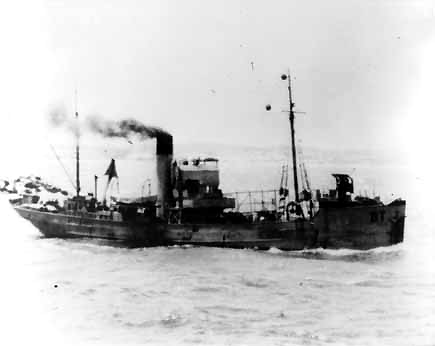 5.1943: With owners permission, requisitioned for war service as a minesweeper (P.No.FY.1743). 1951: Sold for breaking up. IJmuiden registry closed. 02/08/2009: Page published. 7 updates since then. 28/04/2017: Corrected incorrect Official Number and removed FMHT watermark. This entry was posted in Steam Trawlers, Steamers (Picture) and tagged Boston DSF, Parkes on August 2, 2009 by Fred Smith. 1918: Launched by Canadian Vickers Ltd, Montreal, Canada (Yd.No.) 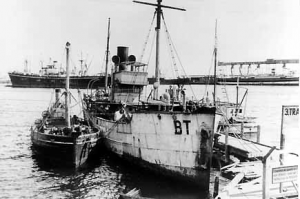 (Canadian “Castle” – “T.R.” class) for The Admiralty (paid for and built under direction of RCN) as TR.26. 21/22.5.1918: Completed and commissioned in Royal Canadian Navy (1-12pdr). 19.12.1918: Paid off and laid up. 1920: Accepted offer of Rose Street Foundry & Engineering Co Ltd, Inverness (Captain D. J. Munro as agent) to bring drifters with trawlers as escorts to UK for lay-up in Muirtown Basin, Caledonian Canal, Inverness prior to sale and possible refit for classification as steam trawlers (The Rose Street Foundry & Engineering Co Ltd letter dated 12 April 1920). 1921: Brought over at The Admiralty’s expense. 2.1926: Rejected offer for all remaining trawlers at £2,000 each (B. Allenby, Aberdeen letter dated 10 Feb 1926). 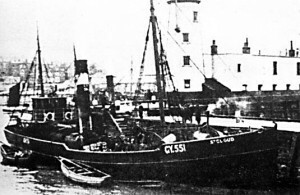 8.1926: Sold “as is” to Boston Deep Sea Fishing & Ice Co Ltd (64/64), Grimsby. 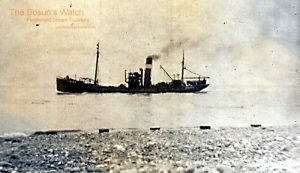 10.9.1926: Registered at Grimsby as MARIE EVELYNE (GY398). 10.9.1926: Fred Parkes, Blackpool appointed manager. 14.9.1926: Sold to Fred Parkes (64/64), Blackpool. 21.9.1926: Fred Parkes designated managing owner. 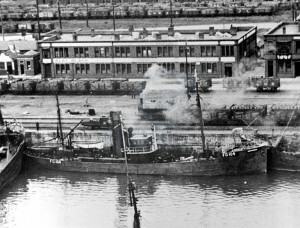 9.1926: Sold to Pêcheries & Armements “La Rochelle-Océan”, La Rochelle. 2.10.1926: Grimsby registry closed. Registered at La Rochelle. 1937: Sold to Soc. Nouvelle des Pêcheries à Vapeur, Nantes. This entry was posted in Steam Trawlers and tagged Boston DSF, Castle, Parkes on July 31, 2009 by Fred Smith. 1899: Completed by Earle’s Shipbuilding & Engineering Co Ltd, Hull (Yd.No.446) for Grimsby Victor Steam Fishing Co Ltd (64/64), Grimsby as St. LOUIS. 25.2.1899: Frederick Baxter Coulson appointed manager. 25.2.1899: Registered at Grimsby (GY1092). 25.2.1899: Vessel mortgaged (64/64) to Arthur Henry Leslie Melville and Eustace Abel Smith, Lincoln (64/64 joint mortgagees) (A). 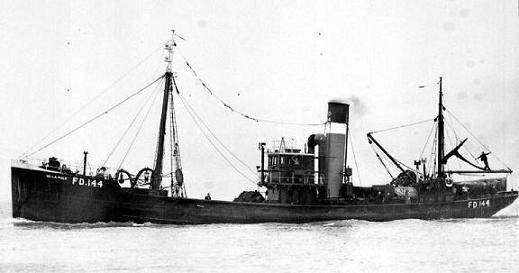 14.3.1905: Vessel mortgaged (64/64) to The Union of London & Smith’s Bank Ltd, Grimsby (B). 15.9.1908: Grimsby registry closed. Registered at Frederikshavn as Hajen. 1.7.1910: Frederick Baxter Coulson appointed manager. 3.6.1910: Registered at Grimsby as St. CLOUD (GY551) (BoT Minute M9929/1910). 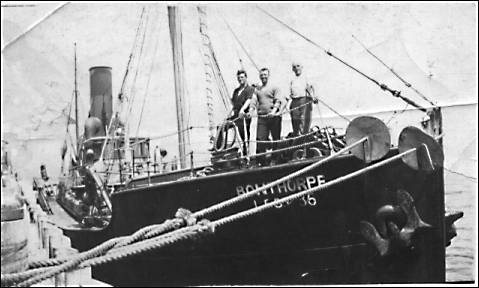 6.6.1910: Vessel mortgaged (64/64) to The Union of London & Smith’s Bank Ltd, Grimsby (C). 20.7.1911: Matthew William Jennson appointed manager. 17.3.1914: Sold to George Fawcett Gibson, George William Tindall and Thomas Whitehead (64/64 joint owners), Scarborough. 23.3.1914: Registered at Scarborough (SH30). 16.12.1914: Bombardment of Scarborough by the Imperial German Navy ships Derfflinger, VON der TANN and KOLBERG. At 8.02 am in misty weather as St. CLOUD waited offshore to enter Scarborough to land, the bombardment began. Sk. George Shaw and the mate, Tom Robson were having breakfast when the deck watch informed them that warships were rounding Castle headland. Getting under way and proceeding into harbour, Sk. Shaw ran St. CLOUD straight up the beach alongside the West Pier; the crew all jumped ashore and ran for their lives. By the time the German warships had moved on to Whitby and it was safe to return to the harbour, the tide was on the ebb and St. CLOUD was drying out with her engine still running. It was widely believed at the time that St. CLOUD had unwittingly led the Germans through the minefield which was untrue as U-boats had been watching the fishing fleet come and go for several weeks. 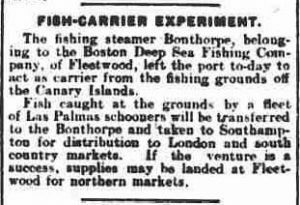 27.1.1916: Sold to The Premier Steam Fishing Co Ltd (64/64), Grimsby. 1.2.1916: Registered at Grimsby as St. CLOUD (GY856). 1.2.1916: William Ellis appointed manager. 3.9.1918: Sold to James Coombes (64/64), Grimsby. 18.9.1918: James Coombes designated managing owner. 23.9.1918: Vessel mortgaged (64/64) to National Provincial and Union Bank of England Ltd, London (D). 15.2.1924: National Provincial and Union Bank of England Ltd re-styled to National Provincial Bank Ltd, London. 23.9.1925: Sold to Boston Deep Sea & Ice Co Ltd (sic) (64/64), Grimsby. 30.9.1925: Fred Parkes, Blackpool appointed manager. 11.3.1927: Sold to James Pattison (64/64), West Hartlepool. 11.8.1927; Vessel mortgaged (64/64) to Midland Bank Ltd, London (E). 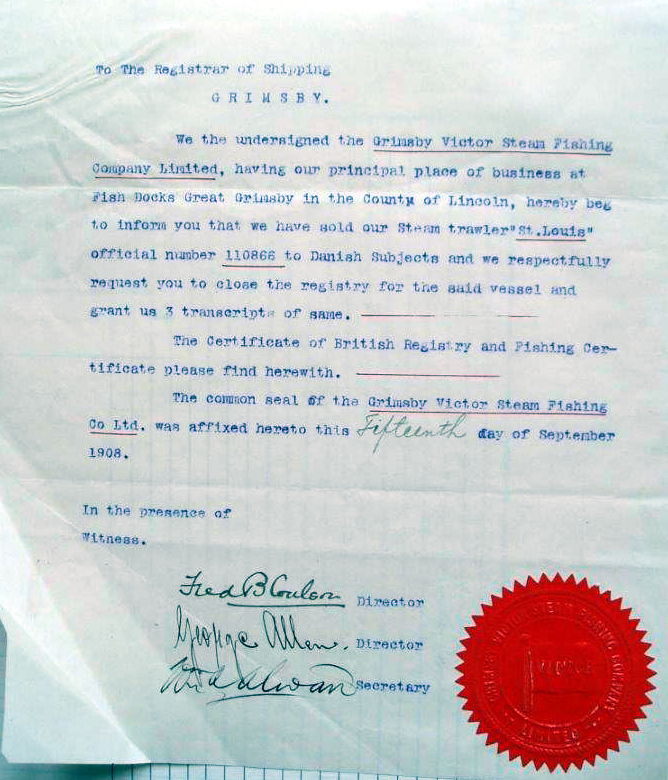 3.12.1927: Transaction 23.9.1925 name of the company is Boston Deep Sea Fishing & Ice Co Ltd. Amendment to register allowed under Chief Registrar’s Order No. 466 dated 2.12.1927. 6.2.1928: James Pattison designated managing owner. 22.3.1934: Grimsby registry closed “Vessel sold for breaking up”. Document courtesy of Grimsby Reference Library. 09/06/2009: Page published. 5 updates since then. 17/06/2018: Removed FMHT watermark from image. This entry was posted in Steam Trawlers, Steamers (Picture) and tagged Boston DSF, Parkes on July 9, 2009 by Fred Smith. 1918: Completed by Collingwood Shipbuilding Co Ltd, Collingwood, Ontario (Yd.No.54 or 55) (Canadian “Castle” – “T.R.” class) for The Admiralty (paid for and built under direction of RCN) as TR10 . 16.5.1918: Completed and commissioned in the Royal Canadian Navy (1-12pdr). 8.1919: Paid off and laid up. 1920: Accepted offer of Rose Street Foundry & Engineering Co Ltd, Inverness (Captain D. J. Munro as agent) to bring drifters with trawlers as escorts to UK for lay-up in Muirtown Basin, Caledonian Canal, Inverness prior to sale and possible refit for classification as steam trawlers (The Rose Street Foundry & Engineering Co Ltd letter dated 12 April 1920). Brought over at The Admiralty’s expense. 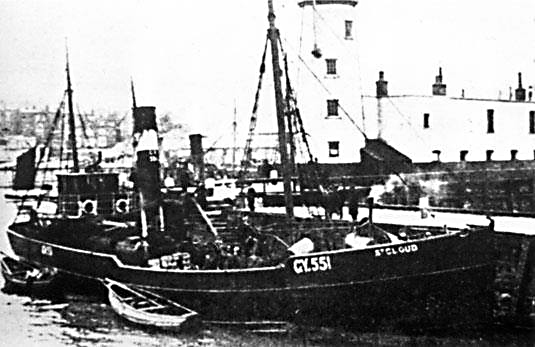 26.6.1926: Sold “as is” to Boston Deep Sea Fishing & Ice Co Ltd, Grimsby (Basil A. Parkes, Blackpool, manager). 19.7.1926: Registered at Fleetwood as BONTHORPE (FD104). 1927: Engaged in an experimental trip to Canadian waters (Capt Leslie William Caxton). 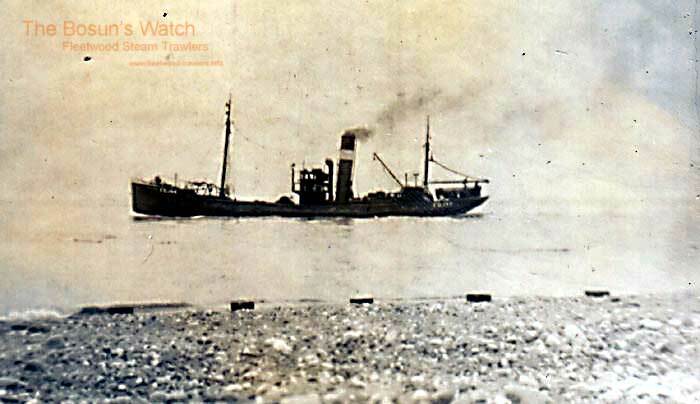 6-9.1928: Engaged in experimental trip to West African coast below the Canary Islands (Capt Caxton). 5.1929: Sold to Western Australia Trawling Co Ltd, Perth, Western Australia. 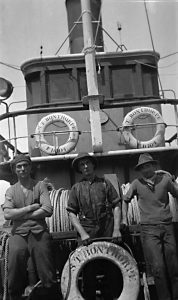 30.5.1929: Sailed Fleetwood for Fremantle, WA (Capt Caxton). 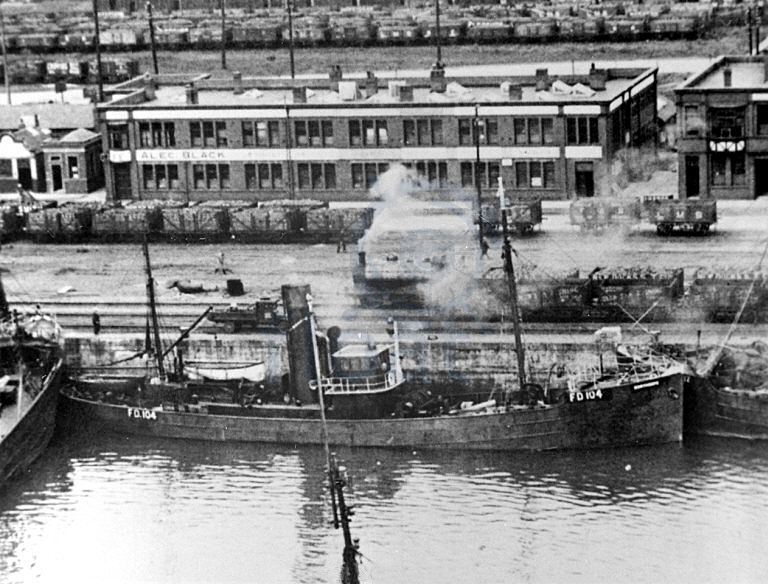 26.8.1929: Arrived Geraldton, WA for bunkers after eventful voyage. Based at Albany, WA using the Town Jetty with Capt Caxton as master. 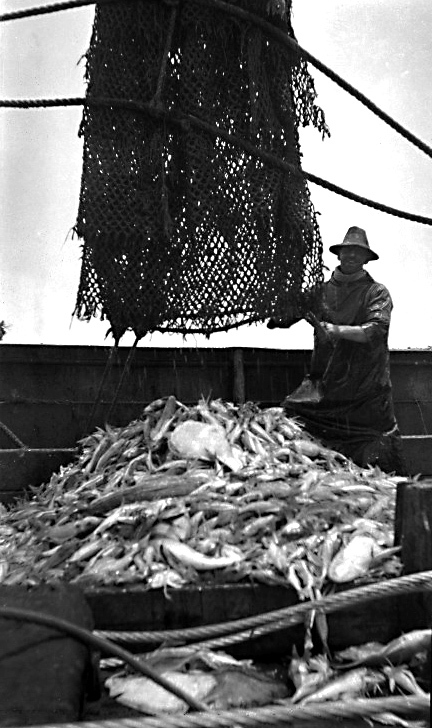 Employed trawling new fishing grounds in the Great Australian Bight. Also fished east of Albany as far as Esperance and made some very good landings. 17.10.1930: Registry noted “Sold out of District”. 1933: Company in liquidation. Laid up at Fremantle with salted boiler. 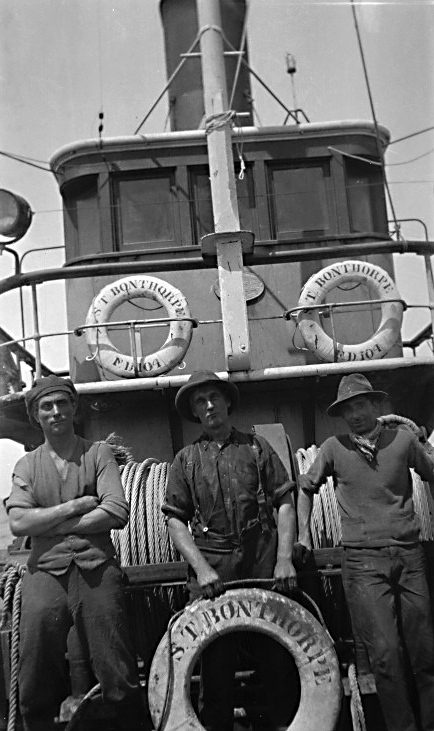 26.8.1933: Sold to Albany Tug Company, Albany, WA (Alexander Armstrong & Capt Clemence Douglas) for £200. Converted to a tug. 1939: Partnership dissolved, company wound up. Became property of Alex Armstrong, Albany, WA. 27.11.1939: Requisitioned for war service (RAN) as an anti submarine trawler. 10.12.1939: Commissioned in RAN (P.No.FY85). 1941: Fitted out as a minesweeper. 17.2.1945: Paid off and laid up. 1948: Sold to Mark Dakas, Broome, WA. 1949: Sold to Mrs Mary Dakas, Broome, WA. 1950: Fitted out to a barge tug. 3.10.1950: At Fremantle in 75mph gale, moored in pens, bows driven 15ft into wooden jetty when jetty struck by motor vessel CORAMBA (3551grt/1948) which had broken away from River Buoys. Minor damage. 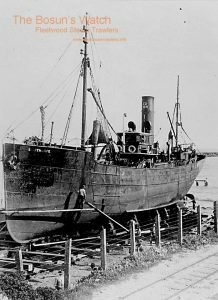 3.4.1951: Sold to Marine Contractors Pty Ltd, Cairns, Queensland. 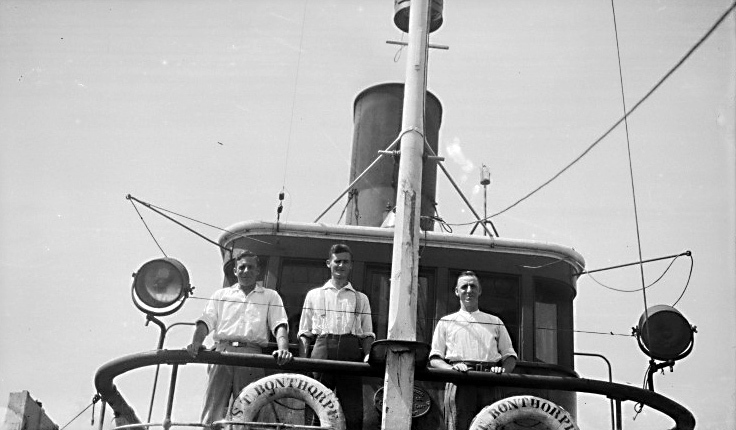 17.7.1951: Surveyed after fitting out as a barge tug. 17.9.1951: Alterations to particulars following survey at Albany dated 17.7.1951. 94.06 net. 1954: Arrested as firm went into liquidation. 18.8.1954: Sold to Marine Contracting & Towing Co Ltd, Cairns, Queensland. 1955: Laid up at Cairns. Sank at berth and buried under the infill for new sugar terminal at Senrab Point. Picture courtesy of The State Library of W.A. November 1929 – Arthur Shuttleworth released cod end. 18/12/2017: Removed FMHT watermark and added an image. This entry was posted in Lost Vessels, Steam Trawlers, Steamers (Picture) and tagged Boston DSF, Castle, Lost on February 16, 2009 by Fred Smith.